South Africa overpowered a game England to win the first Test of the three-match series in Durban. For 40 minutes England held their own against a side that had only five days to prepare for the contest. The score was 6-6 at the break but after the restart the Springboks increased the physicality. Tries from Morne Steyn and Jean de Villiers effectively secured the match for the hosts and a late touch-down by Ben Foden was a mere consolation. 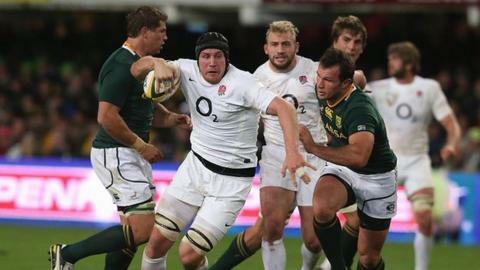 While Stuart Lancaster will no doubt take positives from his side's performance, England would have hoped to catch an undercooked Springboks cold at sea level before the series moves to altitude. Meanwhile, South Africa's new coach Heyneke Meyer will be heartened by the spirit and organisational levels of his side. The visitors' early kicking out of hand was loose and a box kick from Ben Youngs led to a threatening run by veteran winger Bryan Habana. But Farrell settled any England nerves with a penalty on six minutes after uncapped lock Eben Etzebeth went off his feet at a ruck. The Springboks sprung into life just after the 10-minute mark, Habana putting a big hit on Youngs after a pin-point Garryowen by Morne Steyn before blind-side Willem Alberts picked up the loose ball and went rumbling through England's spintered defence. Morne Steyn followed up with a clever cross-kick and levelled the scores from bang in front after a desperate England had fallen off-side. South Africa came close to England's try-line again when scrum-half Francois Hougaard released number eight Pierre Spies, but the Bulls giant was clattered by Manu Tuilagi. England nicked the lead courtesy of a Farrel three-pointer following a strong carry by number eight Ben Morgan, but the hosts were on level terms again through the unerring boot of Steyn. Chris Ashton then carved an opening for England, darting off his wing and scuttling into the opposition 22, only for Hougaard to dislodge the ball in the tackle. While the amount of kicking may not have pleased the purists, the action in the first half was unquestionably intense, with England well-organised in defence and impressive at the break-down. Steyn almost gave the hosts the lead on the stroke of half-time after Tom Johnson handled in a scrum, but the Boks fly-half pushed his penalty attempt wide. South Africa started the second half the stronger, waves of attacks crashing at England's line before Steyn eventually darted over for the first try of the match. The Springboks were not sated and they should have increased their lead when Hougaard opted for a tap-and-go rather than an easy three points in front of the posts, only for England to force an infringement. The hosts kept coming, Habana barrelling through a couple of tackles and JP Pietersen very nearly going over in the corner, before punches were exchanged between Farrell and De Villiers as tempers boiled over. With 20 minutes remaining, skipper De Villiers scored the Boks' second try, which was just reward for his side's overbearing physicality. But Farrell gave England a lifeline directly from the restart, popping over a penalty after Foden caught the hosts napping and was hauled down a few metres short of the line. Farrell reduced the deficit to four points with another three-pointer only for Steyn to make sure of the result with two late penalties. Foden did cross for a morale-boosting try in the corner in added time but England now face the daunting task of attempting to level the series at Ellis Park in Johannesburg, a Springboks stronghold. South Africa: Z Kirchner; J P Pietersen, J de Villiers (capt), F Steyn, B Habana; M Steyn, D Hougaard; T Mtawarira, B du Plessis, J du Plessis, E Etzebeth, J Kruger, M Coetzee, W Alberts, P Spies. Replacements: A Strauss (for B du Plessis, 66) C Oosthuizen (for J du Plessis - blood - 49-58), F van der Merwe (for Etzebeth, 58), K Daniel (for Coetzee, 73), R Pienaar (for Hougaard, 56), P Lambie (on for Kirchner, 41), W Olivier (for Habana, 32-41). England: M Brown; C Ashton, M Tuilagi, B Barritt, B Foden; O Farrell, B Youngs; J Marler, D Hartley, D Cole, M Botha, G Parling, T Johnson, C Robshaw (capt), B Morgan. Replacements: L Mears (for Hartley, 76), P Doran Jones (for Marler, 73), T Palmer (for Botha, 59), P Dowson (for Morgan, 62), L Dickson (for Youngs, 73), T Flood (for Barritt, 54), J Joseph (for Brown, 78).